The majority of area residents don’t just feel okay about living in Houston – they would choose to stay in the Bayou City even if given a choice to move, according to the 2017 Kinder Houston Area Survey. The 36th annual survey also revealed that traffic continues to be the dominant concern, people are less worried about crime and are increasingly supportive of immigration and gay rights. Rice University Sociology Professor Stephen Klineberg, founding director of Rice’s Kinder Institute for Urban Research, conducted the survey and will publicly release this year’s findings today at the annual Kinder Institute Luncheon at the Marriott Marquis in downtown Houston. 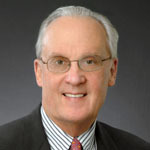 Tom Bacon, founder of Lionstone Investments, will be the inaugural recipient of the new Stephen L. Klineberg Award for his work as chair of the Houston Parks Board and his leadership of the Bayou Greenways 2020 Project. The award recognizes an individual who has made a lasting positive impact on Greater Houston. Traffic continues to be the biggest problem facing people in the Houston area, according to 24 percent of this year’s survey respondents. Another 16 percent mentioned the economy and 15 percent crime. Despite these concerns, more than two-thirds of all area residents in 2017 said they would stay in the Houston metro area even if they could choose to move away. There’s a lot more, beginning with the 2017 survey homepage here, multiple Urban Edge posts about the survey here, and two Chron stories to boot. Mayor Turner makes an announcement about a new program for revitalizing some core neighborhoods. Mayor Sylvester Turner plans to focus Houston’s community development efforts on five low-income neighborhoods as part of his Complete Communities initiative announced Monday. The program comes without a price tag or implementation timeline, and the mayor has committed no additional money for housing and community development. Instead, Turner said the city will redirect 60 percent of its local and federal housing dollars to the five pilot neighborhoods: Acres Homes, Gulfton, Second Ward, Northside Village and Third Ward. That amounts to roughly $34 million annually, if federal funding remains steady, on top of $28 million in available local housing funds. The city intends to finalize development plans for each of the five neighborhoods in January, after several months of community engagement. Turner said programs could include additional heavy trash pickup, weed abatement, sidewalk construction or single family home repair – things the city already does in neighborhoods across Houston. “These short-term projects will generate enthusiasm and serve as a catalyst for support from outside organizations and the local community,” the mayor said. See here for the Mayor’s press release. Leah Binkovitz the The Urban Edge adds some more detail. Turner cited a slew of private entities involved in the effort including the Greater Houston Builders Association, Commonwealth Funding, Wulfe & Co. and Midway Companies. He didn’t elaborate on the exact nature of those partnerships. Though the city’s investment period was open-ended, the mayor said his administration will focus on short-term projects, like heavy trash sweeps, park and community center repairs, enhanced weed abatement and improved sidewalks and street lighting, as well as home repairs and public art to highlight the transformations underway. “I’m not placing any limit on it,” said Turner. “We stay until we reach that benchmark.” Specific benchmarks for each neighborhoods have not yet been identified. The city will finalize its plans for each neighborhood by January 2018, after a community engagement process, according to the city. “This not a one-size fits all approach,” the mayor said. Monday’s announcement came after Turner faced criticism earlier this year for city decisions that effectively barred low-income housing from wealthy Houston neighborhoods, according to a federal investigation. Citing his decision to table the low-income housing tax credit project proposed at 2640 Fountain View in a census tract that was almost 90 percent white, the federal housing department said that decision and others were based, in part, on racially-motivated opposition from community groups. But instead of crafting a corrective plan, the city has vehemently denied the findings, and Turner has asked the agency to rescind it. Simultaneously, Turner has moved forward on his Complete Communities initiative, arguing that low-income Houstonians should not have to move from largely low-income communities to reap the benefits often associated with wealthier neighborhoods, often labeled as “high opportunity” communities. “I vowed that we cannot allow Houston to be two cities in one, a city of haves and have-nots,” Turner said. There are still a lot of details to work out, and a number of similar neighborhoods that would presumably be next on the list after these five. The goal here is to upgrade the infrastructure in these neighborhoods, making them better for existing residents, who haven’t seen a lot of investment from the city, while also making them more attractive to the kind of businesses that thriving neighborhoods need, all while (hopefully) not causing appraisals to soar or the kind of developers who would raze everything in order to build luxury condos to swoop in. Easier said than done, but the goal is a good one. All parts of the city need maintenance and new investments, and there’s a lot of room for infill development to ensure the city remains a vibrant alternative to outward sprawl. I look forward to seeing how this goes. It’s pretty basic, as this report lays out. A new report released [Tuesday] by TransitCenter, a foundation dedicated to improving urban mobility, finds that developing transit in walkable areas and offering frequent, fast bus and rail service is the key to increasing urban transit ridership. The most important “first mile/last mile” solution is walking. The majority of transit riders, including 80 percent of all-purpose riders, typically walk to transit. This finding underscores the importance of putting transit stations in busy, walkable neighborhoods; building offices and housing within walking distance of transit; and providing more and safer pedestrian routes to transit. The two most important determinants of rider satisfaction with transit are service frequency and travel time. The availability of information and conditions at the station or stop were also important, suggesting that real-time information and shelters are important amenities for transit agencies to provide. On the other hand, power outlets and Wifi were rated the least important items out of a list of 12 potential service improvements. There are three common patterns of transit use: occasional riders who take transit once in awhile, commuters who take transit regularly but only for work, and all-purpose riders who take transit regularly for multiple purposes. Transit agencies should strive to grow this third category of rider, as they are the most reliable and financially efficient customers to serve. All-purpose riders are more prevalent where it’s easy to walk to transit, and where transit is frequent and provides access to many destinations. Transit riders are sensitive to transit quality, not “captive” to transit. For decades, transportation professionals have talked about two kinds of transit riders: car-owning “choice riders” who use transit when it meets their needs, and carless “captive riders” who will use transit regardless of its quality. Who’s On Board finds that the “captivity” of carless riders is severely overstated. People who live and work near better transit ride transit more often, whether or not they own cars. When transit becomes functionally useless, there are very few people who will continue to use it; agencies can take no one for granted. Who’s On Board offers several recommendations for local governments and transit agencies to improve transit service, including creating dedicated lanes to reduce travel time, improving frequency on routes with high ridership potential, and zoning to concentrate development around transit corridors. More information about the report is available here. If you look at the Recommendations on page 12 of the report, you’ll see that pretty much everything there was implemented by Metro in its bus system redesign. The main thing that still needs to be done, which is the first recommendation for local governments on page 13, is improving sidewalks. Every dollar that we can reasonably spend towards that goal will be worth it. Read the report and see what you think. The Chron story on this is here, and Urban Edge has more. I’d forgotten all about this. When a sprawling tract of land lining Buffalo Bayou east of downtown hit the market three years ago, some of Houston’s most prominent observers of urban development put forth ideas about what could be done with the 136-acre site boasting both water and skyscraper views. Visions for the property included repositioning existing buildings as cutting-edge workplaces, adding townhomes and apartments along tree-shaded streets where trolleys could shuttle people to and from downtown, and creating spots where Houstonians could rent bikes and take canoes into the bayou. Now, with the recent sale of the property, some of those visions may start to take shape – though they could be years away. An affiliate of Houston-based Midway, the company behind CityCentre, GreenStreet and other local mixed-use developments purchased the site in May, property records show. The seller, William Harrison, a wealthy Houstonian with business in energy and real estate, bought it in late 2012 from KBR. The engineering and construction company had owned the onetime office and industrial complex since 1919, when the company was Brown & Root. Most of the buildings there have been demolished. Anne Olson, president of the Buffalo Bayou Partnership, lauded Midway for its focus on park space, including a project the company is developing in the Upper Kirby neighborhood next to a park that’s been around for more than 60 years. The partnership owns an easement on the property that will allow it to expand its hike and bike trail system through it. See here and here for the background. People were excited when the property was sold in 2012, then it continued to sit there undeveloped for almost four more years before being sold again. Maybe this time will be different, though with the current state of the local economy and the housing market, it’s hard to imagine anything happening in the short term. Swamplot and The Urban Edge have more. It’s kind of amazing to me that the Ashby Highrise saga is still a newsmaker. In a major ruling that could stymie future legal challenges against developers, a state appellate court has reversed a key portion of the 2014 judgment awarding damages to residents opposed to the controversial Ashby high-rise. Neighbors of the residential tower proposed for 1717 Bissonnet at Ashby had claimed it would reduce the value of their homes, intrude on their privacy and create a slew of other problems. A judge in Houston two years ago concluded there was no way to legally stop the project. But he said the residents were entitled to $ 1.2 million in damages, even though construction had yet to begin. The eagerly awaited opinion filed Thursday in the 14th Court of Appeals is a big win for the Houston development community and it brought the partners involved a sense of vindication as they prepare to move forward with the project. The reversal applies to damages awarded to 20 homeowners near the site at 1717 Bissonnet and Ashby where Buckhead has been planning a 21-story residential tower the company said it still plans to build in the leafy neighborhood near Rice University. Thursday’s opinion also reversed the ruling that the developers would have to pay the homeowners’ legal fees. The appeals court affirmed the remainder of the judgment, including the trial judge’s refusal to grant an injunction halting the project. In recent years and likely a result of the earlier Ashby ruling, property owners in Houston’s urban core have filed lawsuits to stop developers from building. If the court had upheld the damages, it would have set a precedent for future cases, said Matthew Festa, a professor at Houston College of Law who specializes in land-use issues and who testified for the developers’ side during the December 2013 trial. “Basically it would have hung a million-dollar price tag on the building permit,” he said. A copy of the decision is here. The original ruling was made in 2014, and we are past the tenth anniversary of this case. As the story notes, the residents could try again after the thing gets built and it is shown to lower their property values, but who knows if that will ever happen? Despite the setback, as a Swamplot commenter notes, they’ve delayed the project well past the real estate boom time in Houston, and if nothing else bought themselves at least a decade of not having this highrise as their neighbor. Not that bad an outcome no matter what happens next, really. Lower Westheimer is one of Houston’s most well-known streets, but on some fronts its reputation isn’t a positive one. Narrow and bumpy, the street is both a hub of retail and recreation activity and also a harrowing bike or automobile trip from time to time. 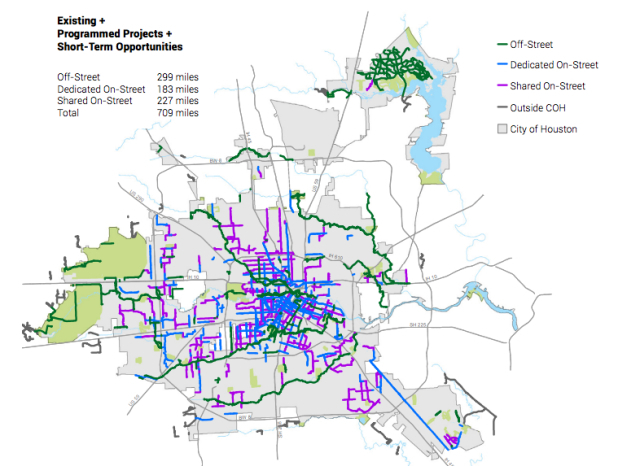 Everyone has a story or a suggestion of how to make it better – and next week the city is going to carve out time to listen to them in hopes of improving one of Houston’s premier streets. As part of ReBuild Houston, officials are considering design changes for the street, a months-long process started by an advisory committee, moving to public comment on Monday evening. Officials guiding the process said while no final designs will be shown for what Westheimer should look like from Shepherd to Main. Westheimer turns into Elgin at Bagby. “We will be presenting background material and existing conditions information and asking the public for their preferences and priorities,” said Matthew Seubert, a senior planner with the Houston Planning and Development Department. Swamplot has a map of the area in question. One of the things hampering transit in the area is the curve in the street between Mandell and Commonwealth, combined with the narrow lanes that make it impossible for one of the articulated (i.e., longer and higher-capacity) buses to run on Westheimer. That’s a problem, given how busy that bus line is. Seems to me the obvious solution is to reduce Westheimer to one lane each way for that stretch. It’s functionally one lane each way between Hazard and Mandell anyway, thanks to there being on-street parking. I’m sure the subject will come up, and you can make your own voice heard at that public meeting. I’ll be interested to see what comes out of this. Houston’s transportation future – and perhaps its economic vitality – relies on more options than new freeway lanes to make room for more cars, Mayor Sylvester Turner said Tuesday. “The solution is to increasingly take advantage of other modes of travel,” Turner told business and elected leaders at a lunch event hosted by Transportation Advocacy Group – Houston Region. The mayor, who has talked about a transportation “paradigm shift” since taking office in January, mentioned a laundry list of mobility projects that Houston must embrace, ranging from regional commuter rail to improved pedestrian access. Nothing by itself can abate Houston’s growing congestion, the mayor acknowledged, but together the options could reform how people travel. Also, he favors a better balance of state and federal transportation funding, which heavily supports highways over public transit in the region. “We will have to make choices on how to use limited space on streets to move people faster,” Turner said, noting that nine out of 10 working residents in the area rely on their own vehicle to get to and from work. Houston today – and in the future – is a far different place than the one its highways initially served. Rather than a development pattern focused solely on downtown, Houston is an assortment of small, concentrated job and housing centers. Turner said the city’s transportation should reflect that by offering walkable solutions and local streets capable of handling the traffic in places such as the Texas Medical Center and Energy Corridor. As mobility options increase, the mayor said it will be up to officials to focus attention where certain transportation solutions can do the most good and ignite the least political furor. Minutes after his speech concluded, listeners were already dissecting the mayor’s statement on light rail and its obvious reference to the decadelong discussion of a proposed east-west rail line along Richmond Avenue to the Galleria area. See here for thoughts expressed by Mayor Turner to the Texas Transportation Commission in February. I wouldn’t read too much into that comment about “forcing” rail into places that don’t want it. For one thing, the opposition to the Universities line has always been loud, but there’s never been any evidence that it’s broad. The evidence we do have suggests there’s plenty of support for that line in the neighborhoods where it would run. In addition, recent remarks by Turner-appointed Metro Chair Carrin Patman suggest the Universities line is still on the agenda. Perhaps there’s a disconnect between the two – in the end, I can’t see Metro putting forth an updated rail referendum that includes the Universities line over Mayor Turner’s objection – but I doubt it. I would just not read too much into that one statement without any corroborating evidence. Houston Tomorrow, which has video and a partial transcript of Mayor Turner’s remarks, has more. Beyond that, this is good to hear, and even better to hear more than once. The reality is that as with things like water and energy, there is only so much room to add new road capacity, and it starts getting prohibitively expensive, in straight dollar costs as well as in opportunity costs, to add it. It’s far cheaper to conserve the capacity that we already have, which in the case of transportation means getting more people to use fewer cars. I talked about all this at the start of the Mayoral race last year, and I’m heartened to see that Mayor Turner’s priorities have been in line with many of the things I was hoping for. A lot of this talk still needs to be translated into action, but you can’t have the action without the talk first, to make people aware of the issues and get them on board with the solutions. The Mayor has done a good job of that so far, and it’s great to see. You have to admit, this is kind of clever. A Houston developer has filed a pre-emptive strike against the owners of a luxury high-rise near the Galleria to head off an “inevitable lawsuit” over its plans to build a tower next door. “We’re a little bit in shock,” said Karen Brown, president of the Cosmopolitan Condominium Association, which is now a defendant in a lawsuit filed by the developer this week in Harris County. Brown said Wednesday that her group met with the developer, Dinerstein Co., several times to discuss homeowners’ concerns over the size of the proposed tower, its proximity to their own 22-story building, and related traffic and safety issues. She said the association wants the building to be half as tall and 100 feet farther away. But she said she was surprised to learn that the owner of the lot next door, an affiliate of Dinerstein Co., had filed suit against her group. The dispute concerns a proposal to build a high-rise condo on the northwest corner of Post Oak and San Felipe, adjacent to the Cosmopolitan, 1600 Post Oak Blvd. The developer purchased the 1.5-acre parcel, currently a shopping center, last year. In its lawsuit, the developer is asking for a declaratory judgment prohibiting the homeowners association from asserting a nuisance claim for the construction of the tower. It also wants a judge to declare that the association does not have standing to assert an action “based on alleged violations of city ordinances.” Attorney’s fees are also being sought. The developer claims in the lawsuit that it addressed concerns raised by the condo owners by modifying the proposed building’s design. The changes included lowering the height of the parking garage, allowing it to line up with the Cosmopolitan’s garage; moving the building’s cooling systems to the roof; and designing the structure so views from the Cosmopolitan would be less obstructed. Basically, “we’re suing you before you can sue us”. Well, the best defense is a good offense, so one can see the allure. Nancy Sarnoff adds a few details. “It’s an interesting strategy for the developer to file first and to be the plaintiff,” said Matthew Festa, a South Texas College of Law professor who specializes in land-use issues. But other than the role reversal, “it’s replay of the Ashby,” said Festa, referring to the nearly 10-year-old case in which homeowners opposed a developer’s fully entitled plans to build a residential tower in their upscale neighborhood near Rice University. In the Ashby case, the plaintiffs argued multiple claims, including that the high-rise would worsen traffic and block sunlight, and that its construction would damage the plaintiffs’ house foundations. Wilson, whose firm defended the Ashby developer in litigation, said nuisance law needs to be clarified. He hopes the pending opinion in the appeal will do just that. See here for all my prior Ashby blogging, and here for more on the appeal of that verdict, which who knows when will be resolved. I’m just gonna keep the popcorn warm and see how this goes. Swamplot has more. What do you do with a problem like I-10? From a conversation that Cite Editor Raj Mankad conducted with Andrew Albers and Ernesto Alfaro, who co-teach a survey of landscape architecture at the Rice School of Architecture. 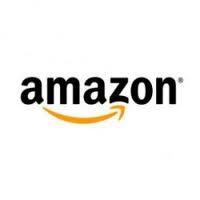 Mankad: … its massive expansion. We talked about designers finding opportunities in the most problematic of sites. What is the opportunity there? Albers: There is a bottleneck that exists at the reservoirs in the Energy Corridor. The Energy Corridor has been a huge economic driver for the city. And where Eldridge Parkway meets I-10 and then Memorial Drive is at its heart. These intersections are routinely blocked with traffic creating quality of life issue for those who find themselves in the area. Partially in response to these concerns, The Energy Corridor District assembled a team to investigate the future of the corridor. The district commissioned a master plan to address these and other issues. This master plan documented ideas that could be implemented throughout the city. Very simple ideas that have been around since the birth of cities. Greater connectivity. Parallel roads. The answer is not more lanes, the answer is more options. The plan looks at ways to transform the existing infrastructure that we have—park-and-ride lots and bus lanes. METRO can adjust them to create a system that offers options and that gets people away from the reliance on the single-occupant car. A circulator bus would move people around the Energy Corridor. If you go to lunch in the Energy Corridor, you have to get to your garage, get out of your garage, drive to where you want to go, find parking. By the time you have done that, it is 30 minutes. Then you have to repeat the whole process coming back. Your lunch hour is consumed by going and coming. So take that out of the equation with a circulator bus. Instead of driving to the Energy Corridor, maybe you could get on a bus and come to the Energy Corridor, get off at the park-and-ride, get on a circulator bus, and get to where you are going. So it is about making linkages, creating different approaches to the problem of traffic. Additionally, I-10 serves as a manmade barrier to pedestrians and bicyclists. The Energy Corridor is split between north and south by I-10. The scale is so immense. The plan looks at ways to links these parts of the city back together; for pedestrians; for bicycles; and for alternative transportation. Mankad: I understand that the big detention basins and drainage ditches scooped out for the I-10 construction could provide more opportunities for cyclists and pedestrians at Langham Park. There is always this positive and negative, this yin yang, especially with hydrology. Alfaro: If it we were to get crazy about I-10, imagine rail or bus rapid transit going through the center in both directions to get all those commuters in and out, parks on either side, and provide the connectivity elsewhere. 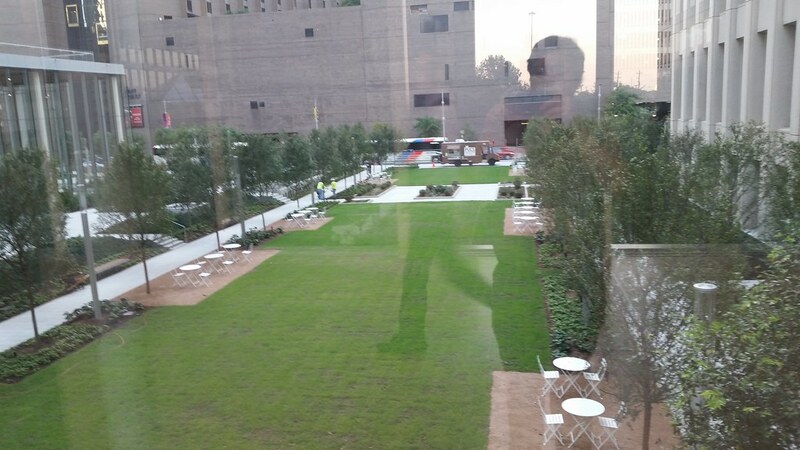 You would have these amazing green spaces in the middle of I-10. That’s what I would want. Make it a landscape. Use the terrain, use the topography. Screw it. The Energy Corridor is itself seeking feedback on this issue, so it’s not just the pointed-headed academics who are thinking about these things. The travel-to-lunch problem that Albers describes is even worse when you consider that a lot of those trips involve taking indirect, roundabout routes because you can’t get from Point A to Point B directly thanks to the presence of I-10. Circulators would help a bit with traffic, and would also enable more people to take transit to work in that area, as would making life easier for pedestrians. We do a lot of things to facilitate highway driving in this town, and a lot of those things have negative effects on local traffic that we just haven’t given any thought to in the past. The Energy Corridor is trying to deal with those effects now, as well they should. I look forward to seeing what they do. 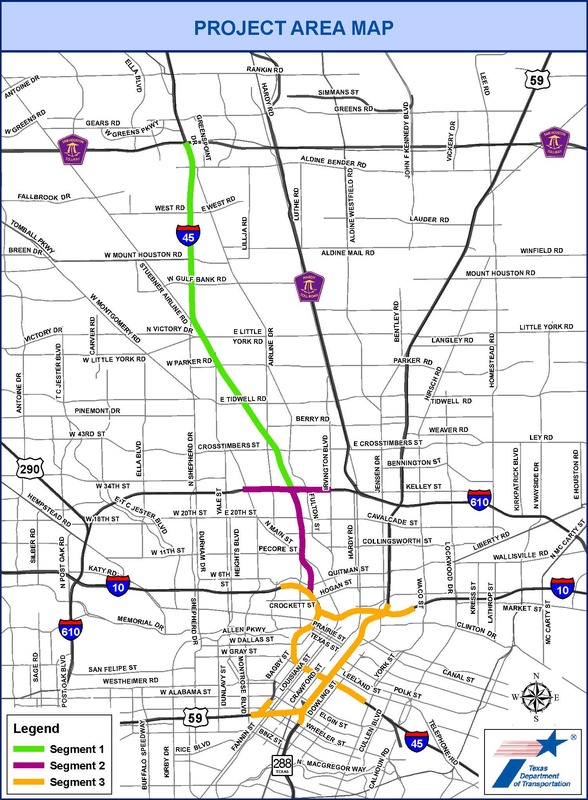 Should a major freeway plan consider the needs of cyclists? Of transit riders? And if we’re going to tear down and reconstruct the entire downtown freeway network of the fourth-largest city in America, shouldn’t the final result have better geometry than the mid-century structures it replaces? 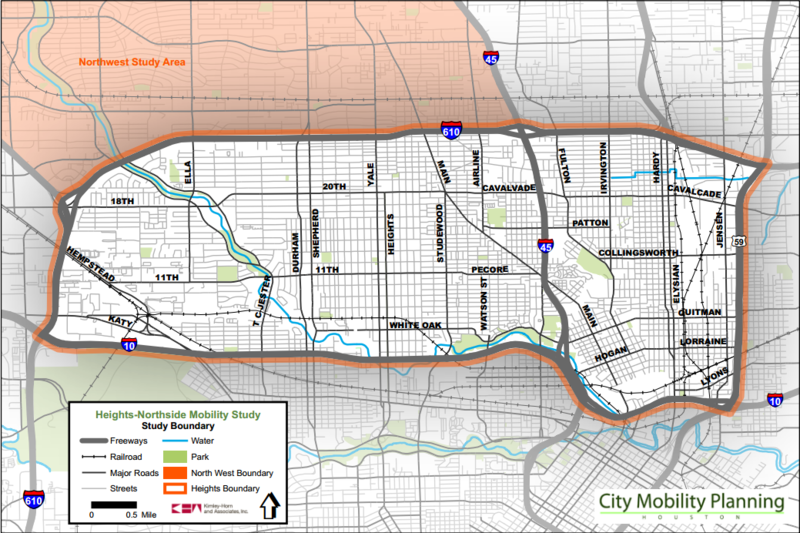 The PDFs below contain an analysis of Houston traffic patterns, a critique of the current plans for Downtown Houston’s freeway ring, and an alternate proposal. My schematic requires less right-of-way, creates a continuous managed lane network for commuter buses and BRT, and eliminates all left-hand exits, among other improvements. The plan is here, and a detailed schematic is here. I’ve read the plan and recommend you do as well, there are a lot of interesting and worthwhile ideas in there. Tory Gattis has a bullet point summary as well as the news that this has attracted the attention of TxDOT, which can only be a good thing. I’m still trying to make sense of the schematic, which is quite detailed, so I don’t have any analysis to offer here, but I do hope that we hear more about this, and in particular that we have a much broader discussion about what we want to happen. As Purple City notes in the introduction of this proposal, what we have now is the result of design decisions that were made decades ago. The reality around us has made some of those decisions less than optimal for us. This is an opportunity to completely change downtown and its environs in a way that better suits the Houston we have now, or it’s an opportunity to lock in those decades-old decisions for years to come. This is why I harped so much on this during the election last year. I still think it’s the most important issue that got exactly zero attention from anyone other than me during the campaigns. What do we want these freeways that dominate our city core to look like, and how do we want to interact with them? We need to understand those questions and give them our best answers. Link via Swamplot. The word “infrastructure” typically conjures up images of towering buildings, layered freeway interchanges and heavily monitored drainage ditches; concrete, cars, trucks and impressive feats of engineering that attempt to mold the natural world and resources to fit human needs. Houston, the fourth largest city in the U.S., has long been hailed, and criticized, for such accomplishments, but a shift in social, political, and economic values has strengthened lesser-thought of elements of city infrastructure: parks and green space. Architectural and engineering professions in Houston have been historically bolstered by energy and the wealth it has pumped into the city, but the recent downturn in oil prices and a more diversified Houston economy has led the city to focus on what the landscape architect can bring to table. Just like “infrastructure,” the term “Houstonization” has begun to mean something completely different. Cities across Texas and the nation, including San Antonio, are taking a closer look at the Bayou City and how the Sun Belt’s biggest metropolis, now 180 years old, has done an about-face to embrace the natural environment as cultural and economic assets to retain and attract residents. Literal mud holes and parking lots have become world-class parks. Houstonians – along with national and international consultants – are currently turning an urban golf course into a botanical garden; they’re redesigning, reconnecting and expanding Memorial Park and its arboretum; they’re connecting 150 miles of bayou trails; and developing engaging programming to activate its 371-and-counting parks. “It takes big civic ideas and the patronage muscle to pull it off,” Birnbaum said. That’s a report from a recent landscape architect’s conference that was held in Houston. OffCite was all over this as well. Lots of good reading there if you’re interested. They also love us for bus system reimagining. Was it hard to persuade people to focus on rerouting bus lines? They had us all put together a list of, what are things you’d like to see done. This was on my list. It took about three years for the agency to be convinced to do it. There was a lot of focus on the fact that ridership was dropping. I was actually offering up a solution that addressed that problem. It probably didn’t hurt that it was budget friendly? It’s funny when you look at this. Why haven’t more agencies done this? Because on the surface it’s a no-brainer: make a system better without putting money into it. In the end we put a little bit of money into it, but using your current resources to do more seems like it’s something everybody would be doing. But it turns out it’s actually really rare. So Houston is open to change and your project has been a progressive triumph. But is the city ever going to reach that urban planning “nirvana”? Yes. I think we’re actually getting there. There are people from all over the United States looking at Bayou Greenways as a model, looking at Discovery Green and Market Square. We’re a city that has suddenly ended up in the national spotlight when it comes to urban planning, and that’s really interesting because 20 years ago, even 10 years ago, we were the joke at the beginning of every urban planning presentation. Yes, I distinctly remember the slide in those presentations. It’s funny. One of the most famous pictures is that picture of downtown Houston covered in surface parking lots, and that’s where Discovery Green is now. Some of the things we got held up for as being bad, like the lack of zoning, I think are turning out to be advantages. The good restaurant scene we have actually has something to do with the fact we don’t have zoning. It’s really odd, parks people are looking at Houston, development people are looking at Houston, transit people are looking at Houston. That’s got to feel pretty good. That’s from an interview with recently reappointed Metro board member Christof Spieler. Spieler has previously said that other transit agencies are closely watching the new bus network rollout – one agency that is considering something similar was here in town on the day that the new maps were implemented, for a firsthand look at how it went. As Spieler says, that feels pretty darn good. Lovett Commercial, a Houston-based developer of neighborhood shopping centers and urban redevelopments, is under contract to buy the downtown post office property and potentially turn it into an urban complex of shops, offices, housing and perhaps a hotel. “It’s extremely rare to find a 16& acre parcel in any major U.S. downtown,” the company said Monday in a statement emailed to the Chronicle by vice president Burdette Huffman. Lovett is also exploring ways to reuse portions of the site’s existing buildings, which sit on the northwestern edge of downtown, just north of Buffalo Bayou and across from the Theater District. Anne Olson, president of the Buffalo Bayou Partnership, was pleased to hear of the company’s plans. She said the plans are in line with the type of mixed-use development the partnership recommended more than a decade ago in a comprehensive master plan for the bayou. See here, here, and here for an abridged history of this site. It has always seemed to be destined for some form of mixed-use development, with a bit of speculation about it as a transit hub thrown in for flair. There’s not a whole lot immediately around it, so it will be interesting to see if this project spawns other development, or if this project is executed as something that is intended to be a stand-alone destination. What would you like to see in this space? Thousands gathered at 401 Franklin Street in downtown Houston to celebrate the opening of a new facility trumpeted as an “ultra-modern” marvel, the hub for the mail that would flow in and out of one of America’s fastest growing cities. But on Thursday, 53 years after the ballyhooed opening of the Houston Post Office, the lunch hour traffic was sparse – a few police officers mailing Mother’s Day packages home, a lawyer, a family seeking passports and a few others. On May 15 at 7 p.m., retail operations at the facility will cease permanently, yet another effect of the United States Postal Service’s struggles with rising debt and a sharp decline in business as clients turn to the Internet and private mail couriers. Six other post offices were targeted for relocation in Houston in the past, including the Third Ward’s historic Southmore Station, University Station, Greenbriar Station, Julius Melcher Station, Memorial Park Station and Medical Center Station, and cuts have also slowed delivery times. A massive outcry prompted the postal service to halt its plans to shutter the Southmore Station facility, which stands at the address of Houston’s first sit-in demonstration. But agency critics and Houstonians said Thursday they would be mourning the loss of the building and the move. The downtown post office has been on the block since at least 2009. The city considered putting in a bid for it last year, possibly as a new location for HPD and the municipal courts, but dropped the idea shortly thereafter in the wake of wailing and gnashing of teeth by developers who had been eagerly awaiting its appearance on the market. The Urban Land Institute hosted a design contest for the site in 2012 to generate some ideas about how to use the space – at one point, a transit center was envisioned as an anchor for it – but I rather doubt we’ll get anything other than high-end apartments or condos, possibly with some retail/restaurant space on the bottom, like with the Rice Hotel. But first, it needs to be sold. I’ve no idea when that might happen. Swamplot has more. How’s this for a big idea? He’s talking about the Pierce Elevated Freeway, the raised stretch of I-45 that hooks around the west side of downtown Houston. With an eye toward improving traffic flow, the Texas Department of Transportation is proposing to re-route I-45 — and to do so in such a way that would leave the roughly two miles of the Pierce Elevated out of a job. And that, say Cryer and other urban dreamers, could be a huge opportunity for Houston. What if, instead of tearing down the Pierce Elevated at an enormous cost, the freeway structure became the base for an elevated linear park — a Houston version of New York’s High Line or Paris’s Promenade Plantée? Martínez’s dream-big conceptual sketches give a sense of the proposal’s size and potential. The park that he and the rest of his team imagine would be 1.97 miles long, and cover 37.7 acres — an astonishing swath of parkland so near downtown. By comparison, New York’s High Line, built atop an unused freight-rail line, is significantly shorter (only 1.45 miles) and much, much skinnier (13 acres). Besides the obvious paths for bikes and pedestrians, Martínez says, there’d be room atop the Pierce Elevated to install all sorts of attractions. Maybe a golf range; or a bike-in theater; a conference center; gardens; or a greenhouse for native plants to be installed along Buffalo Bayou. It sounds a little crazy, but as the story notes, such things do exist elsewhere, with the High Line in New York being a prominent recent example. I would think the main objection to this would be that if the Pierce were to be torn down when TxDOT rebuilds I-45 is that downtown would gain a huge swath of newly developable real estate, which in today’s market would be worth a ton of money. But Piece Skypark as envisioned could be a truly massive amenity for the city, and it wouldn’t necessarily preclude development on or underneath it. I’d at least like to see the idea get discussed and taken seriously. We have two years or more before anything starts to happen. What’s to lose by considering all options? Check out Pierce Skypark’s Facebook page and give it a like if you’re interested. A massive reconstruction of Interstate 45 through most of Houston would topple one of downtown’s most frustrating barriers – the Pierce Elevated – and move the freeway east of the central business district. That’s just one of the major changes Texas Department of Transportation officials included in the $6 billion-plus plan to be unveiled Thursday. It would make I-45 practically unrecognizable to those familiar with its current downtown-area configuration. Two managed lanes in each direction will be added to the freeway between the Sam Houston Tollway and U.S. 59 south of the city’s central business district. Planners recommend moving I-45 to the east side of the city’s core, a change that an analysis suggests could increase downtown freeway speeds. Officials called it a once-in-a-lifetime change that would increase mobility and improve the city center. 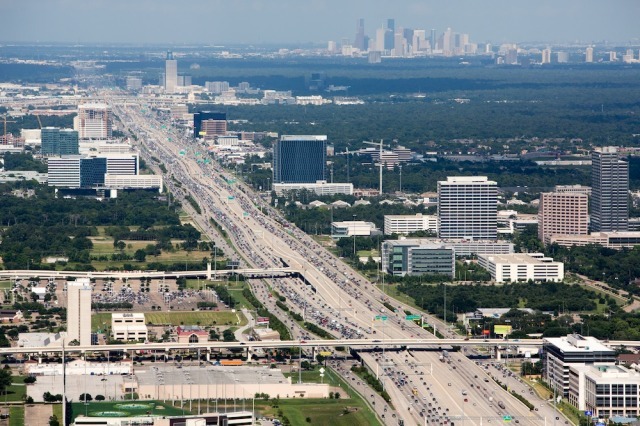 “After having those freeways in the city for the better part of 70 years, it’s challenging and exciting to have the opportunity to come back and reshape how they fit,” said Bob Eury, executive director of the Houston Downtown Management District. The first of three public meetings this month [was] scheduled for Thursday night, when residents and businesses will get their first detailed look at the plans. In 2013, when neighborhood leaders got a look at early versions, some feared the reconstruction would leave a big, concrete scar across their communities. Remaking I-45 will take years, with numerous public meetings and more detailed analysis remaining. Officials said it is too early to pinpoint an exact cost, but transportation officials predict all of the work will cost “north of $6 billion,” said Quincy Allen, district engineer for TxDOT’s Houston office. The final cost will be determined by when officials can start construction, likely in phases starting in downtown Houston after 2017. The central business district parts of the plan alone will cost about $3 billion. See here and here for the most recent updates. The public meeting documents are here. I’m still working my way through them. I’m happy that the roundabout idea appears to be kaput, but there’s a billion details to work out, and until we really understand what this is all about, it’s impossible to say if this is good, bad, or indifferent. I’m more hopeful now than I was before, but I need to read the docs and hear what the folks who have followed this more closely than I have are saying. And – and I really cannot say this often enough – we need to know what the Mayoral candidates think about this. Forget pensions and potholes, if this project goes forward more or less as detailed here, this will be the defining issue of the next Mayor’s tenure. What is your impression of this? Purple City makes an interesting observation. One of the quieter actions of the late Parker administration has been to slowly alter speed limits from 35 or 40mph to 30mph. These reductions aren’t based on an engineering study or field measurements, but on a creative interpretation of state law. Texas sets the default urban speed limit at 30mph in lieu of a study justifying higher speeds. The City is interpreting that to post 30 on roadways which were formerly determined to be safe at 35 or 40. I first began to notice this about a year ago, and had it confirmed by sources within PWE last summer. Thus far, it seems to be restricted to thoroughfares inside the Loop. The existing signage is allowed to disappear (through collisions, failure, theft, etc). When most of the old 35/40 is gone, the road is re-signed at 30. This provides a more gradual transition period than simply changing the signs out overnight. Recently, I noticed that all of the 35mph signage is missing between Allen Parkway and IH-10. 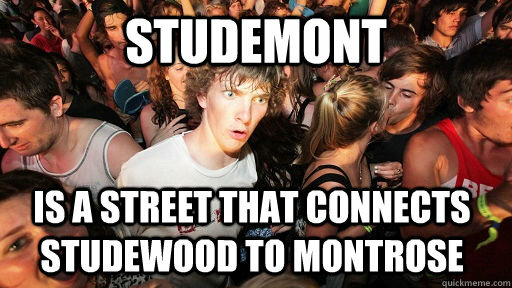 He’s got a Google Maps image with the various sections of Studemont/Montrose highlighted to show what the speed limit is on each. It’s signed for 35 between Allen Parkway and Westheimer, but either signed for 30 or not signed elsewhere. Unless the next Mayor changes direction, my guess is that at some point in the not too distant future, this road will have a 30 MPH speed limit all the way. And you know what? That’s just fine. Twenty-five years ago, when there was little retail or residential development north of Westheimer, a 35 MPH speed limit was reasonable. Nowadays, with pedestrians and bikes and cars slowing down to turn into driveways and side streets, a slower speed makes a lot more sense. Slower speeds save lives, and the streets in Houston’s dense urban areas aren’t just for cars any more. We should be updating the speed limits on these streets to reflect that. Florida and Mellander created an index of economic segregation that takes into account how we’re divided across metro areas by income, but also by occupation and education, two other pillars of what we often think of as socioeconomic status. Among the largest metros in the country, Austin ranks as the place where wealthy, college-educated professionals and less-educated, blue-collar workers are least likely to share the same neighborhoods. The interesting pattern: By income, the wealthy (households making more than $200,000 a year) are more segregated than the poor (families living under the federal poverty line). By education, people with college degrees are more segregated than people with less than a high school diploma. By occupation, the group that Florida has coined the “creative class” is more segregated than the working class. The problem of economic segregation, in other words, isn’t simply about poor people pushed into already-poor neighborhoods — it’s even more so about the well-off choosing to live in places where everyone else is well-off, too. Click over to see the charts. The Trib and the Chron both reposted this story, while the Statesman reported on it; it would be nice if one or more of them did some followup to examine the particulars in some more detail. I haven’t read through the study yet, but intuitively it feels right, and at least as far as inner Loop Houston goes, I’d say gentrification is a big driver of it. The increased desirability of neighborhoods like Montrose and the Heights have transformed them from bastions of cheap housing with scattered pockets of poshness to exactly the kind of segregated areas Florida and mellander describe, where lot value alone far exceeds what used to be the cost of a typical house. I don’t know what if anything can be done about this, but I do think it’s an issue that the Mayoral candidates ought to be talking about, since it really is changing our city in a fundamental way. What do you think? Remember the Richmond Strip? If you were here in the 90s you probably do. You also probably haven’t been out there since the 90s. Now there’s a plan to restore some of the luster to that part of town. It was along this stretch of Richmond Avenue that revelers rushed out to celebrate after the Rockets won two NBA championships in the mid-1990s. 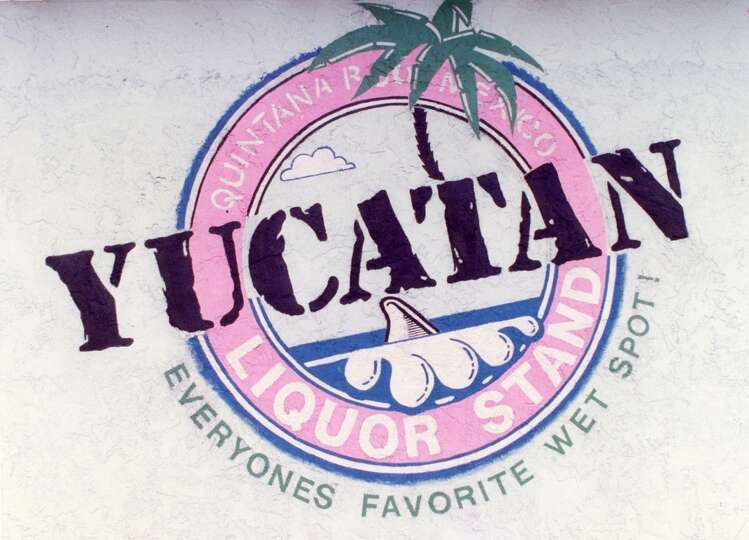 The annual St. Patrick’s Day parade drew ample crowds to the six-lane street and to bars like the Yucatan Liquor Stand. Every weekend, partygoers found a vibrant scene of restaurants and dance clubs, arcades and two-stepping joints. Widely referred to as the Richmond Strip, the area – just past the Galleria from Chimney Rock to Hillcrocft and from Westpark to Westheimer – was the place to see and be seen for much of the 1990s, a flashy drag of bars, clubs and restaurants seen as the Houston’s answer to Sixth Street, Beale Street and Bourbon Street. Now the largely abandoned entertainment district is a focal point for city and business leaders in the area, hoping it can shake its forlorn image and draw on the energy of nearby businesses and retail opportunities along nearby Westheimer in the Galleria area. “It only takes driving up and down the streets in the area to see the problems that exist,” City Councilman Mike Laster, who represents the area, said Tuesday. “We want the area to overcome the negative image,” said Daniel Brents, chairman of the Urban Land Institute panel commissioned to study the area. The panel, which includes real estate experts, landscape architects and urban planners, presented a general concept to revitalize the area at a community meeting on Tuesday. They interviewed business owners and neighborhood groups as part of the study. A primary suggestion was to make better use of existing tools such as management districts, tax increment reinvestment zones and other incentive programs to help spur development. John Dupuy, a landscape architect with TBG Partners, noted the disparate land uses in the area that was originally meant for single-family homes but evolved over time. He cited a few current bright spots, including new townhome developments, a group of exotic car dealerships and custom car shops and an immigrant community that recently created an independent soccer league. Problems identified by the panel include infrastructure, drainage and a lack of lighting. The group’s interviews with interested parties also found that a lack of open space, parks and safe sidewalks hampered development. There’s a great then-and-now slideshow here, and you can see a copy of the plan here. I doubt the Strip will return to its past glory as an entertainment destination, but there’s no reason why it can’t be an attractive and enticing part of town again. It’s a great location, between the Galleria and the Energy Corridor, and it’s got a lot of potential. I look forward to seeing what they make of it. More changes coming to my neck of the woods. Some of the old warehouses lining a stretch of Sawyer Street across Interstate 10 from the Heights are being primed for new development, as this First Ward area continues to morph from industrial hub to an upscale artsy neighborhood. Houston-based Lovett Commercial is transforming a 1950s warehouse at Sawyer and Edwards into Sawyer Yards, which will have about 40,000 square feet of space for restaurants, retail or offices. The company is looking to fill another 5-acre parcel at 2000 Taylor just south of I-10 at Spring Street. The property is across from the Sawyer Heights Target. H-E-B quashed rumors that it was considering opening a store there, though the grocery chain has been looking around. Jon Deal, who has developed artist studios in the area, is planning another project at the old Riviana rice facility at Sawyer and Summer. The project is called the Silos on Sawyer, and it will include artist studios, creative workspaces and some retail. The main building contains more than 50,000 square feet. Deal said he, Steve Gibson and Frank Liu of Lovett Commercial own – separately or in partnerships – at least 35 contiguous acres in the area. They hope to master-plan the acreage. The area is part of a cultural district recognized by the state, Deal said. The program is not currently being funded, he said, but when it is, it will allow artists to seek grant money. There’s an awful lot of activity going on in this general area, which stretches from Studemont to Houston Avenue between I-10 and Washington Avenue. I consider it a positive for the most part – the existing industrial area didn’t exactly add much to the quality of life in the larger area, and a lot of it is not actively used now anyway – but there are concerns. Mostly, traffic on the north-south streets – Studemont, Sawyer, and Houston – is already a problem, and there are limited options to ameliorate it. Sawyer, for example, is a narrow one-lane-each-way street south of the Target retail center, and as you can see from the embedded image or this Google Map link, there aren’t any other options thanks to the active freight train tracks, which by the way regularly block traffic on Sawyer and Heights. (This is part of the corridor that would be used for some variation of commuter/high speed/light rail, if and when it ever happens.) There is at least the off-road Heights bike trail along Spring Street that connects the area to the Heights (passing under I-10) and downtown (passing under I-45), and there is a sidewalk along Sawyer; it definitely needs an upgrade, and there’s a lot of potential to make it much nicer when the properties west of Sawyer get sold for development, but at least it’s there. The potential exists to turn this part of town into a compelling modern urban residential/mixed-use area. In the absence of any unified vision for the myriad developers to draw inspiration, I hope at least no one does anything to permanently derail such a thing. Is this the end of the two-car household? While predicting continued global growth in car sales as countries like India and China become more affluent, KPMG’s recent white paper about trends affecting the car industry [PDF] sees different forces at work in the United States. I’m a little surprised that driverless cars aren’t mentioned here, since that observation about vehicle idle time and its implications for vehicle and ride sharing is a common feature of stories about driverless cars. Make of that what you will. The Highwayman, who shared that Streetsblog link, looks at this from the local angle. Some of the services mentioned are already up and running in Houston, and expanding their footprint rapidly. ZipCar is downtown and spreading to other areas, and Uber has stuck around as Houston enacted new laws governing paid rides. In fact, after sort of anchoring its operations within Loop 610, Uber has expanded its footprint (the Uberprint? Ubersphere?) to suburban communities. Wednesday morning, Uber vehicles were available in Katy, Cypress and Tomball (I would have looked at more suburbs, but I got scared they were tracking me and closed the app and considered burning my smartphone). Still, a lot of Houston isn’t exactly built for just walking down the block and grabbing a ZipCar or hoping an Uber is nearby. Huge swaths of the region are residential, and workers can commute for miles. Many two-income families might hang onto cars. It’s more likely that those living closer in will be less inclined to maintain a two-car household. In the suburbs, not exactly ripe for ridesharing, the change might be in households going from four vehicles to two rather than from two to one. One possible implication of this KPMG report is that it may lead to greater demand for housing that is closer to employment, retail, and entertainment centers, which today would mean more urban-centric housing, though going forward this may include a good chunk of the more mature suburban areas, as many of them are trying to create urban-like centers within them. I’ve made this point myself in talking about the possible benefits of services like Uber. One reason why far-flung suburban development has been popular is because the cheaper housing more than offsets the larger expenditures needed on transportation. The greater the potential savings on transportation costs, the more attractive closer-in living will be. There are a ton of variables here, so making anything but the vaguest of predictions is dicey business, but this is something to keep in mind. Cities like Houston that are concerned about losing population (and with it political power) to their surrounding suburbs ought to see about doing what they can to facilitate transportation alternatives that allow people to get away from the one-car-per-adult model for living.